As a new teacher, I did not realize how important poetry actually is to reading fluency. To me it wasn't worth spending a lot of time on because poems are short and most of the time, students just memorize them anyway, they aren't actually reading them. I now know that the very reason I did not want to use them was the reason that they are so effective. Yes students often memorize them, but that allows them to focus on their speed, the intonation and the rhythm. 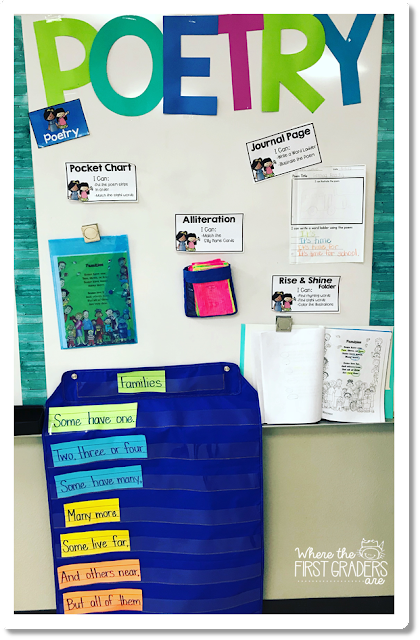 I saw a HUGE difference in how my students were able to read with expression after a couple of months using this poetry station. 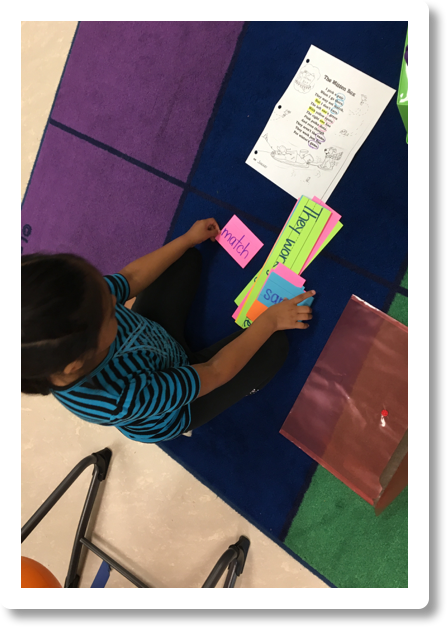 I cannot take credit for these awesome sight word poems. They were given to me by a veteran teacher, but you can find grade level appropriate poems just about anywhere. I should really start by saying that my students have a copy of each of these poems in a folder at their desk called their Rise and Shine Folder and we practice one or two of daily. 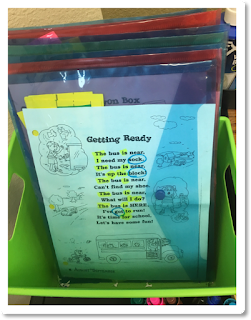 Students can use their Rise and Shine folders during the poetry station to read the poem, highlight sight words, circle rhyming words or color/illustrate the poem. I keep all of our poems for the year in one basket. I really love the idea of giving the student's choice at the poetry station and I love that they get to choose which poem they want to work on. It also works well because they have plenty of things to choose from if they finish a poem before the station is over. I keep our poems in colored poly envelopes that I found at Dollar Tree 3 for $1. They work so good because they are easy for students to open and close. I also really like that they are colored, but you can easily see what's inside. 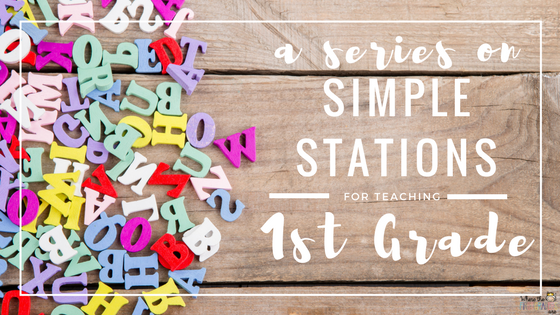 Check out my post on my kids' favorite "Silly Names" station here. 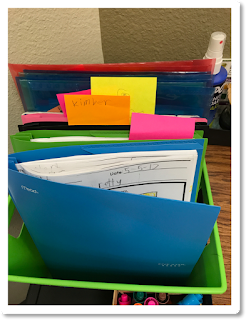 Our poetry response folders are something that I started this past year. 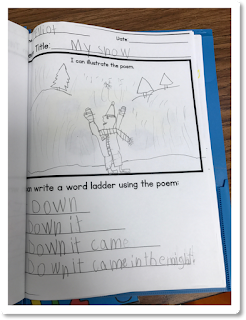 We were doing the same activities in a regular journal, but I found that my students did much better when they had a little bit more structure to follow. 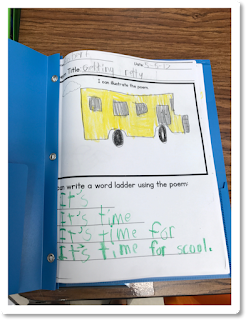 I chose to have my students focus on two kinds of responses to their poems. The first thing my students had to do was to choose their favorite line from the poem and create a word ladder. 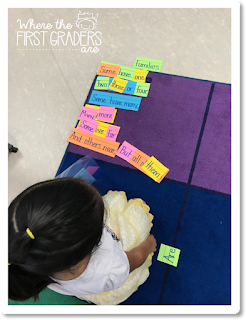 A word ladder is so great because it really works on reading fluency. Then, students illustrate that line. The kids love it because they see it as a time to draw and color. What they don't realize is that they are actually communicating what they visualize when they read the poem. Since they are only responding to one line of the poem, they can generate 5-6 or more responses to each poem so I never have to change anything in the station, yet they still have a TON of options to choose from. So what if a student starts a response, but doesn't finish it during the ten minutes they are given for the poetry station? We use post-it notes to mark our spots if we are not finished. 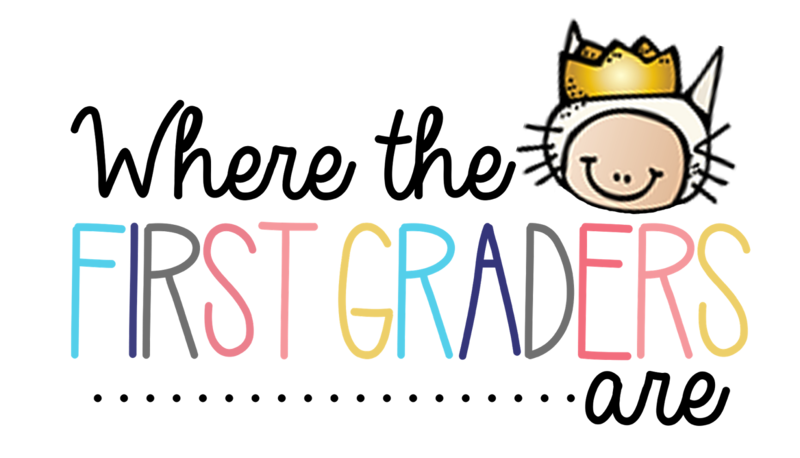 The students have to write their name and stick it at the top of the page. They know that before they start a new journal response, they have to check the sticky notes for any unfinished work first.